Nnimmo Bassey on the Catch-22 at COP 22: Rich Nations Continue to Pollute as Temps Keep Rising | Democracy Now! director of the Health of Mother Earth Foundation in Nigeria. He is the author of several books, including Oil Politics: Echoes of Ecological Wars. AMY GOODMAN: Here at the U.N. climate summit in Marrakech, Morocco, the World Bank has just published a new report finding natural disasters are pushing 26 million people into poverty each year. World Bank President Jim Kim said, quote, “Severe climate shocks threaten to roll back decades of progress against poverty,” unquote. One of the hardest-hit areas by climate change has been the continent of Africa. We’re joined now by one of the leading African environmentalists, Nnimmo Bassey, director of the Health of Mother Earth Foundation in Nigeria, author of several books, including his latest, Oil Politics: Echoes of Ecological Wars. Welcome to Democracy Now!, Nnimmo. NNIMMO BASSEY: Thank you very much. AMY GOODMAN: It’s great to see you again. I recall seeing you several years ago being dragged out by security, protesting one of the previous U.N. summits. You’re a voice inside and outside these summits. We’re speaking now when the president-elect of the United States, Donald Trump, has, by all accounts, threatened to pull out of the [UNFCCC], the United Nations Framework [Convention] on Climate Change. Can you explain what that is and the significance of this? NNIMMO BASSEY: United Nations Framework Convention on Climate Change. AMY GOODMAN: —Convention on Climate Change, was signed off on in the United States by President George H.W. Bush. NNIMMO BASSEY: Right, in 1992. 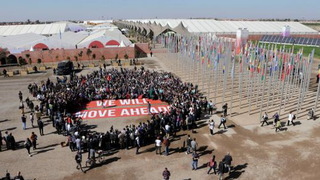 And now, the basic principles of that convention includes the spirit of equity and what is known in the COP parlance as “common but differentiated responsibilities,” which recognizes the historical responsibilities of rich countries, industrialized countries, who have taken up virtually all the carbon—the space that carbon could ever occupy in the atmosphere without the Earth experiencing catastrophic global warming. So, the convention recognizes further, those who contributed most to the problem should also do most in solving it, in terms of providing climate finance, providing technology and showing some leadership in terms of cutting emissions at the source. But, you know, over the years, especially since COP 15 at Copenhagen, the COP you referred to where I was thrown out from, now where the Nigerian—I mean, the African leader, leading negotiator, Ambassador Lumumba, wept at a press conference, saying that following—I mean, having a decision coming out of the agreement that looks at temperature that will go up more than 1 degree was like sentencing Africa to death, and that why should Africans celebrate $10 billion being offered per year up ’til 2020 and then $100 billion from then henceforth? Now, that, the principle of the Copenhagen Accord, is what eventually was crystallized as the Paris Agreement. AMY GOODMAN: Now, wasn’t that Obama? The beginning was Copenhagen. NNIMMO BASSEY: That was Obama. AMY GOODMAN: The end is the Paris Agreement, is President Obama. NNIMMO BASSEY: Yeah, really, that was the beginning of Obama and the end of his tenure. Now, the beginning of his tenure derailed the climate negotiations, because, from then, it became an issue of countries making voluntary pledges on what they—how they’re going to cut emissions and what they’re going to do about global warming. Before then, the regime—the Kyoto Protocol was all about nations having legally binding commitments to cutting emissions. But now on, it’s pledge and review. And there are many—from the Paris Agreement, what the rich countries are going to do mostly is simply to engage in carbon trading and carbon offsetting. So they will keep on polluting, and then they will assume that their pollution is offset by soils in Africa, forests in Africa and elsewhere. AMY GOODMAN: What if President Trump pulled out of the Paris Agreement but not the UNFCCC? NNIMMO BASSEY: If he pulls out from the climate—from the Paris Agreement, it would mean that the world see clearly what we’ve been seeing all these years, that the U.S. has not been very positive in terms of climate negotiations. The U.S. has been a stumbling block in terms of binding commitments, in terms of countries stepping up ambition. It’s been with the pressure of industry, I believe. Vested interests has kept the U.S. from advancing an ambition. And the U.S. being so powerful in the COP, in the whole process, has pulled back all the other rich industrialized nations from doing what they ought to do. So, if Donald Trump pulls out of the Paris Agreement, if the U.S. pulls out of the Paris Agreement, it will now show that, look, the world, now you don’t have the major force that has been keeping you from showing some ambition, so you can begin afresh and do something that will help the world. But if the U.S. pulls out of the United Nations Framework Convention on Climate Change, it means that this is a very hard day for the world, because then there will be—it would put the whole exercise into extreme jeopardy. AMY GOODMAN: This summit here Marrakech, Morocco, is being held on the continent of Africa. The significance of this, Nnimmo Bassey, you from Nigeria? NNIMMO BASSEY: You know, people have called this the African COP. And my question is: Why didn’t you call the Durban COP “African COP”? AMY GOODMAN: The Durban, South Africa, COP. NNIMMO BASSEY: Actually, this is—this is COP 22. For us, it’s like Catch-22, because, either direction, Africa is going to lose. The rich countries are forcing the process to go in the direction of polluters continuing to pollute without stopping pollution. And if polluters continue to pollute, no matter how much money anybody makes from carbon trading, from carbon offsetting, like reducing emissions from deforestation and degradation, and all the other marks of marketed environmentalism, it’s not going to add up to actually reducing the amount of carbon in the atmosphere, which means the temperature is going to rise. Right now, countries have put on the table what they call nationally determined contributions. And from—and the Paris Agreement said we are aiming at 1.5 degrees Celsius temperature increase or well below 2 degrees Celsius. We don’t know what “well below 2 degrees” means. But from what the nations have said they’re going to do, the world is set for over 3 degrees Celsius temperature increase, and that means setting Africa on fire. AMY GOODMAN: Before we wrap up, my condolences on the death of some great Nigerian activists, Ken Wiwa, the son of Ken Saro-Wiwa, who pioneered the fight against Shell corporation crisscrossing with pipelines Ogoniland in Nigeria, and also Oronto Douglas. NNIMMO BASSEY: Oh, yes, we’ve lost real great, great, great comrades and great fighters. And, you know, Ken Saro-Wiwa was executed, was murdered by the Nigerian state 23 years ago. And just a couple of years ago, eventually, the United Nations Environment Program validated all that he was campaigning about. And now his son, Ken Jr., has been—he just made a—featured in a documentary on Nigeria’s environmental crisis and climate crisis. And now he’s passed, he’s passed away. And, of course, my friend and brother Oronto Douglas. All very painful. AMY GOODMAN: Nnimmo Bassey, I want to thank you for being with us, Nigerian environmentalist, activist. He is the author of the new book Oil Politics. That does it for our broadcast. I’m Amy Goodman, from Marrakech, Morocco.